The global canned soups market is prognosticated to create new prospects in the near future as manufacturers hope to better settle themselves even outside of the older consumers group with the help of new innovations. There is already an influx of the development of a greater count of health-conscious soups and more diverse range of flavor offerings. Millennials are studied to get attracted to organic products that feature lower sodium content and no artificial ingredients. One of the leading companies dealing with soups, Campbell offers a broad scope of condensed and ready-to-serve options, which gives a positive picture of the market. 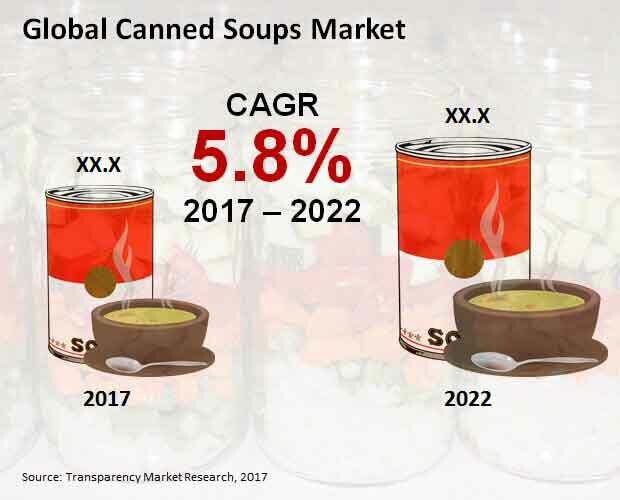 The global canned soups market is envisaged to expand at a CAGR of 5.8% during the forecast period 2017–2022 to achieve a valuation of US$6.5 bn by the final forecast year. In 2017, the market was valued at a US$4.9 bn. The researchers foresee the world canned soups market to be classified according to two categories, i.e. product and ingredient. By product, the market could be segregated into ready-to-serve wet soup, condensed wet soup, and others. Out of these segments, ready-to-serve wet soup is prophesied to secure a larger revenue of US$3.6 bn by 2022 end. It could flaunt an absolute revenue growth of US$0.1 bn annually, which could be greater than other segments in the categorization. In terms of type of ingredient, the world canned soups market is foretold to see a classification into tomato, beans, chicken, beef, broths, artichokes, mixed vegetables, and other ingredients. Each of these segments by product and ingredient segmentations are entirely analyzed in the publication, taking into consideration their revenue, market share, and year over year (Y-o-Y) growth comparisons by region. As per the research of the publication, the international canned soups market could be classed into Europe, North America, Asia Pacific except Japan (APEJ), Latin America, the Middle East and Africa (MEA), and Japan. Readers are informed that APEJ is expected to be one of the most lucrative regions with a higher revenue growth projected to continue to show face in the next few years. By the concluding forecast year, APEJ could garner a revenue of US$1.9 bn. North America could be another opportunity for players to capitalize on in the coming years. This region is anticipated to collect a handsome revenue by 2022 at a 6.2% CAGR. Europe could bag a decent revenue share in 2017 but also lose 117 basis points (BPS) by 2022. Japan and the MEA, however, are predicted to be on the slower side of growth. Some of the crucial players in the worldwide canned soups market could be Campbell Soup Co., Knorr Foods Co. Ltd., The Kraft Heinz Co., Compass Group USA, Inc., and Juanitas Foods. More players are comprehensively studied in the publication while estimating vital statistics such as company share. Buyers of the publication are expected to receive complete knowledge about the competition landscape of the market. The global canned soups market is prognosticated to be advantaged by additional efforts of brands taken to enhance their nutritional image, such as including more supplemental ingredients, viz. extra fiber and minerals and vitamins, and vegetables. Vendors could offer more exotic canned soups while borrowing ideas from the cuisines of various cultures. Furthermore, there could be an expansion in the flavor varieties of canned soup products. For a bright future in the market, companies are envisioned to stay on the top of food trends to offer products that satisfy the ever-changing palate of consumers. The analysts describe each and every significant aspect and trend of the global canned soups market that concerns its growth and future projections. Manufacturers operating in the world canned soups market are anticipated to gain confidence due to several benefits of condensed wet soup achieved from multiple uses for other home-cooked food preparations. The soup could be used as a base ingredient or as a complete preparation requiring the addition of milk or water while heating. Ready-to-eat broths could also be used as a base ingredient for other preparations. Ready-to-eat wet soups, on the other hand, do not require additional milk or water to heat and eat and could be considered as an easy and a fast meal. Consumers low on time availability are predicted to increase the demand for canned soups as a good lunchtime solution. Soups could also be consumed as part of a dinner meal and not necessarily as a side dish. One of the key attributes that canned soup brands are expected to focus on could be convenience, for which Campbell’s Soup on the Go is a fine instance to look into. The international canned soups market is envisaged to see a segregation into ready-to-serve wet soup, condensed wet soup, and others, as per product. Amongst all of these markets for canned soups, ready-to-serve wet soup could account for a dominating share of 55.8% by the end of 2022. The report provides more information on this particular market, including its absolute revenue growth. According to segmentation by ingredient, the international canned soups market is projected to be classified into tomato, beans, chicken, beef, broths, artichokes, mixed vegetables, and other ingredients. Geographically, the international canned soups market could be categorized into six segments, i.e. Europe, North America, Asia Pacific except Japan (APEJ), Latin America, the Middle East and Africa (MEA), and Japan. Out of these regions, APEJ is forecasted to showcase dominance on the back of its 7.1% CAGR expected to be posted between 2017 and 2022. As per the analysis of the report, there could be some players securing an important position in the worldwide canned soups market. Companies such as Campbell Soup Co., Knorr Foods Co. Ltd., The Kraft Heinz Co., Compass Group USA, Inc., Juanitas Foods, General Mills, Inc., Conagra Brands, Inc., Trader Joe's Company, Hain Celestial Group, Inc., Amys Kitchen, Inc., and Baxters Food Group Limited are profiled by the report authors.